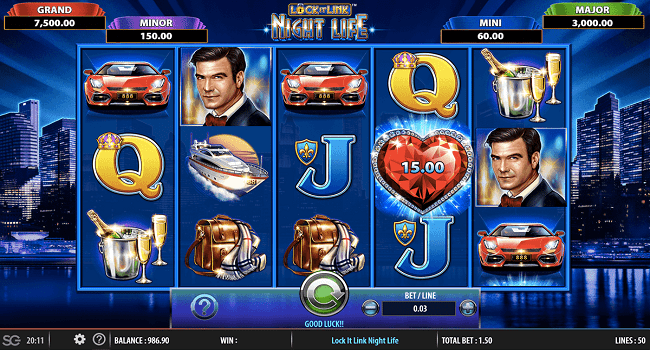 WMS software presents Lock it Link Nightlife Slot game of reels 5 and paylines 50. This is one of the newest online slot game developed by WMS gaming. You can play this slot with starting coin of 50p per spin to €50 per spin. Total coins for the game is 50 by the way. This is a jackpot slot game which offers a jackpot of 150 times of your total bet. There are 2 bonus rounds available in this slot machine. First is Free spin Bonus feature which could offer you 6 to 12 free spins and the multipliers of 3 to up to 8x of your total stake. This is a luxurious slot game which includes symbols like A, K, Q and J playing cards, sports car, bag, a man like James bond and champagne. One of the most important symbols of this slot game is the skyline and it appears only on 3 middle reels. It will trigger Feature selection screen and will yield you 5 times of your total stake. During this feature you can either select Lock It feature or free spin Bonus Feature. Now If you select free spin bonus feature then you will receive 6 free spins plus additional 6 free spins can be triggered as well. On the other hand if a player choose Lock It feature, then you will receive 1 spin on an alternate reel set. This feature sounds complicated but it is as easy as free spin bonus feature. You can win up to 100x of multiplier in this feature, while during free spin feature you can win up to 8x multiplier.